Actually O is also for the Other books I have read in the Morland Dynasty, as I have read the first four books now, but haven't reviewed any of them. So here are some mini reviews for the series so far, ending with the latest book I read, The Oak Apple. The Morland Dynasty is a series that is currently 32 books long, and follows one family through from the War of the Roses, until the 20th century. Along the way there is triumph and tragedy, war and peace, birth and death, and glimpses into major historical events through the eyes of the fictional Morlands. 1434: the Wars of the Roses are the backdrop for the founding of the MORLAND DYNASTY. Power and prestige are the burning ambitions of the domineering, dour Yorkshireman Edward Morland. He sets out to secure his family's future by arranging a marriage between his son Robert, more poet than soldier, and Eleanor, a ward of the influential Beaufort family. Eleanor is appalled at having to marry a mere 'sheep-farmer', but despite her passion for Richard, Duke of York, she has to obey. Yet this apparently ill-matched union becomes both passionate and tender, and their life together promises prosperity and success - though all too often mangled with tragedy as they are embroiled in the civil strife which has divided families and set neighbour against neighbour. This remarkable marriage truly lays the foundations for the MORLAND DYNASTY. Eleanor Courtney may be an orphan with very little in the way of dowry, but that doesn't mean to say that she doesn't have high hopes for an excellent marriage. When she finds her husband is to be a sheep farmer, albeit a very large and prosperous sheep farmer, from the North she isn't best pleased. Eleanor is nothing but pragmatic and she is determined that she and her husband are going to start a dynasty, and that their home, Morland Place, is going to become a show home, to be passed through the generations. The only thing that threatens the stability of these ambitions is the unrequited romantic leanings that Eleanor has towards Richard, Duke of York. With the War of the Roses raging, the Yorkist Morland's must do their part, and struggle to hold onto their growing business interests, including their new found connections to the cloth industry. Eleanor is a strong and dominating character both within her family, and in the pages of the book, but it is really the placement of the lesser characters within the well known events that provides the most interesting facets of the story. When we first found out about Eleanor's feelings for Richard, I just assumed that it was the future Richard III that we were talking about. It was only a bit later that I realised that it was a generation earlier, and Richard's father, that had captured her heart. I guess that assumption shows more about me than it did about the book. The events in this book cover from the mid 1430's to around the 1480's, when Richard III lost his kingdom to the usurper who we know now as Henry VII. One of the things that I have been glad of in all of the books in this series so far is that there is a family tree at the beginning of the book, as it is easy to occasionally get a lost as you try to keep track of all the children, grandchildren, and which cousin married which cousin. I originally read this for the Chunkster Challenge of 2009. Whilst it did qualify for that challenge, at 527 pages it didn't feel like a chunkster, and I breezed through it in 2 days. 1501: the turbulence of Henry VIII's reign brings passion and pain to the Morlands as they achieve ever greater wealth and privilege. Paul, great grandson of Eleanor Morland, has inherited the Morland estates, and his own Amyas is set to be his heir. But Paul fathers a beloved illegitimate son, and bitter jealousy causes a destructive rift between the two half-brothers which will lead to death. Paul's niece, Nanette becomes a maid-in-waiting to Anne Boleyn, and at the court of Henry VIII she becomes embroiled in the King's bitter feud with Rome. Through birth and death, love and hatred, triumph and heartbreak, the Morlands continue proudly to claim their place amongst England's aristocracy. 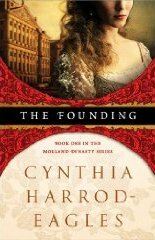 As I am sure she will do more and more, Cynthia Harrod-Eagles places the characters from the Morland family right in the midst of the action. There is a gap between the end of the last book, and the beginning of this one, and so we skip from the end of the War of the Roses, until we are firmly in the Tudor court. The major female character in this novel is Nanette, and it is she who gives us the greatest insight into life at the court of Henry VIII, when she is appointed as lady in waiting to Catherine of Aragon. She is also close friends with Anne Boleyn and Katherine Parr, and therefore we get to witness the rise and fall of the most infamous of Henry's queens, and the aftermath. The time at court is nicely balanced by the time that Nanette spends at home with her family, despite the fact that it features a highly unlikely and somewhat shocking relationship. In the end, love prevails, but that relationship, which I am not going to reveal, is probably the thing that I remember most from this whole book. The religious struggle that Henry becomes embroiled in is well covered in this book, with the opinions of the family split. I would say that this does seem to be something that the author does very well, both in this and and in the future novels that I have read in the series. The head of the Morland family is Paul, and he does seem to be something of a cold fish. He is jealous of his brother, he is unable to show his own children affection, and in turn they become fierce rivals, with tragic consequences. The Princeling is the third volume in the Dynasty series which follows the fortunes of the Morlands, a Yorkshire wool family, from the Wars of the Roses to World War II. A story which began in The Founding and continued in The Dark Rose. The Princeling is set in the adventurous reign of Elizabeth I. The Catholic Morlands are threatened by the upsurge of Protestantism and are forced to seek new spheres of influence, through marriage. John, heir to Morland Place, rides north to bring back the daughter of Black Will Percy, the Borderland cattle lord. But proud Mary will not have him, and John stays in Redesdale, to live the strange, savage life of the Borders, and learn through blood and battle how to win her heart. Lettice, the second Morland, enters the court of Mary, Queen of Scots and weds the harsh, ambitious Lord Robert Hamilton. In a hostile world of treachery and tragedy, the wolfish lord teaches her how to survive and triumph. In The Princeling, Cynthia Harrod-Eagles, with her sweeping style and authoritatively researched background, has written another powerful chapter in the history of the mighty Morland Dynasty, which grows to encompass three great estates - in Yorkshire, Northumberland and Scotland. Having survived the courts of Henry VIII our story moves forward into the Elizabethan era. Once again, love and marriage play a significant part in this novel. Paul and Nanette are back, with the latter once again taking her place at Court. This time it is the court of Elizabeth I, daughter of the woman who was once Nanette's close confidante and friend. Paul is trying to expand the influence of the Morland family and so marriages are sought, with John trying to wed the daughter of Black Will Percy, and Lettice sent to the court of Mary, Queen of Scots. I have to say that Mary Percy was one of my favourite characters in this novel in that she was different from most female characters in the novel with her skills in fighting and hunting, possibly a little bit anachronistic, but oh so much fun. Not all of the characters that we meet are fun to read about, and there are a fair share of unlikeable characters, but the book is once again very readable. The Oak Apple is the fourth volume in the Dynasty series which follows the fortunes of the Morlands, a Yorkshire wool family, from the Wars of the Rose to World War II. The Oak Apple is set in the reign of Charles I, when England has prospered under long years of peace. But peace is suddenly and violently shattered by the advent of brutal civil war between King and Parliament. Edmund Morland seeks to steer a middle course between the opposing factions, but the family is split when his eldest son Richard, brings home a Puritan bride, while his second son Kit, rides to join Prince Rupert and the dashing Royalist cavalry. As bitterness and disillusionment replace the early fervour, the war grinds on, severing husband from wife, brother from brother, and Edmund struggles grimly to preserve the Morland fortune intact, estranged from his sons, alienated at last, even from his beloved wife Mary. A blazing panorama of love and death, grief and triumph, The Oak Apple sees the Morlands at war, struggling for the survival of their loyalties, and their values. I have written before about how much I enjoy reading about Charles II, particularly his return to the English throne, but I can't remember reading anything about the events that led up to his exile to Europe, and the battles that his father, Charles I had with Parliament that led to the English Civil War. This book covers many of those events. Edmund is conscious that his main aim has to be to preserve Morland Place for future generations, and so he treads a fine line by trying to keep in good both with the Royalists and the Roundheads. Those decisions leave no one satisfied, especially not his children and their spouses, and drive a wedge between him and one of the few people who understand him, his devout wife Mary Esther. Like previous heads of the family, Edmund also has his eye firmly on the expansion of the Morland landholdings, and this time his eye is on the New World. Conscious that in order to provide all of his children with land he would have to break up the current holdings, he sends one of his younger sons, who has married one of his cousins, to the new colonies of America where life is much harder than they expected. The most fascinating character for me was one that I only recall hearing about in passing - Prince Rupert of the Rhine. He was viewed as one of the most dashing and for a long time, the most successful, of the King's Cavaliers. It was at one of his first defeats that the Morland's toll was highest. One of the more memorable Morland characters for me from this book will be Kit, who is the second son of Edmund. When he returns home from Oxford, he is a dashing young man, and he is quickly smitten with his beautiful cousin Hero, not at all concerned about the limp that so many others cannot see beyond. When the war starts he enlists with the Royalists, and finds himself in close proximity with Prince Rupert at battle after battle and skirmish after skirmish. The portrayal of the initial enthusiasm, which in time changes to a battle weariness that infects his whole attitude was very moving, and left me hoping that some how he would find a way back to his young family. One of the things about this book, as easily as Harrod-Eagles introduces new characters, she is equally not afraid to kill of minor and major characters. At times this is heart breaking to read, but also helps to give the books a grittiness and realism that is not necessarily always present in novels. Just a quick note on the cover that I have used above. When I do a review I like to use the actual cover that I had, but I looked for ages online to find an image of this one, without success. In the end I had to scan it in to be able to use it. Probably shows how long this book has been in my library system more than anything! So there we have it. Brief reviews of the first four books in the Morland series. Now I just have to keep up with them as I read each book. I have already requested The Black Pearl, the fifth book in the series, from my library. I am looking forward to reacquainting myself with the Morlands. By the way, Sourcebooks is in the process of rereleasing the early books in the Morland series (and I hope that they will continue to do so). If you are looking for them, then here are the covers of the first three books that have already been reissued. These books really interest me, but the count of 30 plus are a bit scary. Loved her Kirov trilogy, and they did read very fast despite the size of them. I actually just got my copy of The Foundling in the mail a few days ago after reading very good things about it. I am hoping that I really love it and want to continue on with the series! Very cool post! Zibilee, I can see myself continuing through the series. Misfit, I must confess that I was a bit intimidated at the thought of starting another really long series, but I couldn't help myself. Great reviews Marg! I've read books one and two and just received the third one for review. I really enjoyed the first one, but the second left a lot to be desired. I really hope book three redeems the series and it sounds like it should! 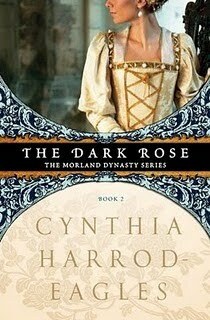 I love a good series that you can sink your teeth into and the Morland Dynasty is perfect for that! I read the Founding and the Dark Rose. Even though I didn't like Dark Rose, I have the third to read for the fall. I enjoy reading about the Morlands and I like the way the history is presented. Very glad I am reading this series. I have only read The Founding so far but would like to read more of the series. At something like 35 books, I doubt I'll read all of them. Thanks for the over view of the first 4.